So there I was in Paris (last month), working in my hotel room, and I took a break from the screen to look out of the 5th floor window at the grey street outside. The street was lined with trees and there were a lot of orange-clad men moving around under the trees, noticeable because most people were dressed in dull browns, greys and black. So I switched my glasses and watched. Under each tree was a square space that was not paved and was covered instead with a metal grille – no doubt a sensible arrangement to avoid muddy footprints. The men were lifting these grilles – they came up in two parts – and raking the ground underneath each. The soil, leaves and litter that were raked up were packed neatly into plastic bags and carried away to a truck parked nearby. I was struck by the amount of care being lavished on this operation. There were tall orange beacons set up on each side of where the men were working and joined by plastic tape to keep pedestrians away from the area. They raked carefully and thoroughly and were meticulous about picking up the debris. Then the grilles were replaced and the alignment checked and adjusted, and there was more sweeping around the edges. They left after a few minutes with their equipment. The pavement under the trees was clean and orderly. What job creation potential there is in just keeping a city clean and orderly! Imagine having to have these grilles made up and installed around every tree on every pavement, and the paving arranged to fit? Then imagine how many teams of workers would be needed to go around and clean them up? Not to mention the orange beacons, the tools and the protective gear needed, that would all produce more employment opportunities. Another part of me is going “What for?” Why all this care lavished on keeping the pavements clean and orderly? Part of the answer is practical – less mud, easier to walk, fewer tripping accidents – and being an avid walker of city streets, this is appealing. But somehow there seems to be more important things to take care of than making pavements easy to walk on. That is surely a pursuit for wealthy countries with money to spare in the pursuit of middle class “living standards”. Why would anyone prioritise this in the face of all the things a city needs to pay for? Perhaps having pavements that are easy to walk on and that do not present dangers to pedestrians is a form of caring for people, for the community that is a city? Are cities in Europe better at making this link between the little things that get taken for granted and so disappear from sight, but actually go towards making cities livable? Is a lack of caring at the heart of what makes one city less livable than another? 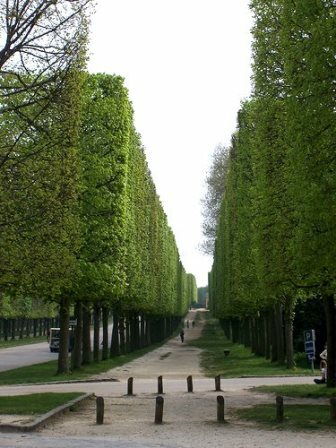 Later on the same day, I took a stroll through the Champ de Mars where I found that the trees are cut into neat cubes. Large trees, neatly trimmed on all sides and at the top. I am mystified at how this is done, what equipment, or magic is needed to create these straight lines at such heights. I can only conclude that the French take job creation to heights that we may not want to ever reach. « A personal, portable tree?